It’s Here: Coachella 2016 Lineup Announced! 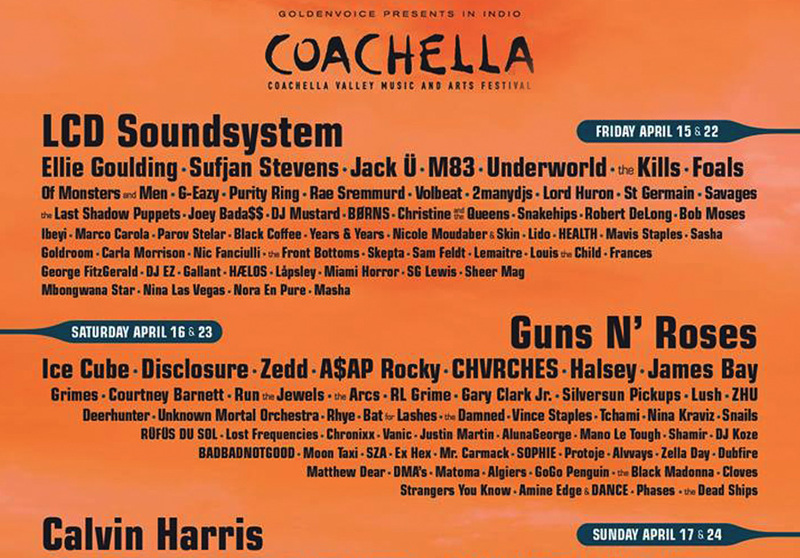 Coachella has today confirmed a hefty lineup for the 2016 event with a roster of the world’s biggest acts. Led by LCD Sound System, Guns N Roses and EDM favourite Calvin Harris, Coachella is set to raise the bar once again. The 2016 festival will also see a huge roster of dance music pioneers including Underworld, Jack U, Zedd, Major Lazer, RL Grime, Disclosure, Flume and the list goes on. When you dig deep down in the electronic side of the line-up, there’s plenty of depth. There’s Adam Bayer, Marco Carola, Sasha, Tchami, Snails, KSHMR, Claptone, plus Australia’s own Rufus and Nina Las Vegas. The festival takes place over two weekends, April 15th-74th and 21st-24th, at Empire Polo Grounds in Indio, California.